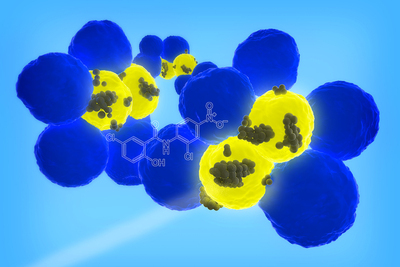 Illinois researchers developed nanoparticles that can target cancer stem cells (yellow), the rare cells within a tumor (blue) that can cause cancer to recur or spread. CHAMPAIGN, Ill. — University of Illinois researchers are sending tiny drug-laden nanoparticles on a mission to seek and destroy cancer stem cells, the elusive and rare cells that can cause cancer to come back even when years have passed since the initial tumor was treated. In a study led by Dipanjan Pan, an Illinois professor of bioengineering, researchers designed nanoparticles that specifically bind to a protein that marks the surface of breast cancer stem cells. Encapsulated in the particles is the drug niclosamide – a drug commonly prescribed around the world to treat tapeworm infections, but in cancer stem cells it turns off key gene pathways that give the cells the stemlike properties that enable them to grow and spread. Cancer stem cells represent a tiny fraction of cells in a tumor, but it only takes one or two to seed a new tumor, Pan said. The challenge for physicians and researchers is not only finding these cells, but treating them. Pan’s group created nanoparticles that target a protein called CD44, which only appears on the surface of cancer stem cells, and tested them on breast cancer tumors in cell cultures and in live mice. The researchers used the nanoparticles to deliver niclosamide, which is on the World Health Organization’s List of Essential Medicines, an index of the safest and most effective drugs in the world. Pan’s group previously found that niclosamide works on a particular gene-regulation pathway in cancer stem cells. In the new study published in the journal Molecular Cancer Therapeutics, the cancer stem cells lost their stemlike properties after treatment with the niclosamide-bearing targeted nanoparticles, making them less able to cause the cancer to recur or metastasize. The researchers also saw a significant decrease in overall cancer cell growth, both in the cell cultures and in the mice. The researchers are working to create a combination therapy that can deliver drugs for the primary cancer, such as traditional chemotherapies, as well as targeted agents that can treat cancer stem cells. They are also testing the nanoparticle drug-delivery system in large animal models to bring it a step closer to the clinic. The National Institutes of Health and the University of Illinois supported this work. Editor’s notes: To reach Dipanjan Pan, call 217-244-2938; email: dipanjan@illinois.edu.